The Colorado Mammoth notched their second win of the season Saturday night, beating the Philadelphia Wings at Wells Fargo Center 12-10. 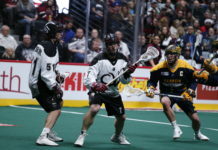 The win was the Mammoth’s first game against the NLL expansion franchise and marks the only meeting between the Mammoth and Wings this season. 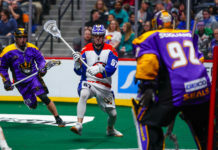 Mammoth sharpshooter Ryan Benesch — who is tenth on the league’s top-ten all-time points list with 969 regular-season points — recorded game high in points, scoring two goals and adding seven assists for a strong nine-point night. Benesch has not posted seven assists in a game since May 2015. Notably, Benesch was named All-Pro First Team for the second time in 2015. Eli McLaughlin and Kyle Killen put together an excellent power-play performance for the Mammoth, scoring two power-play goals each. The Mammoth converted four-of-seven man-up opportunities in their win. In-net for the Mammoth, goalie Dillon Ward played a full sixty minutes, making 43 saves on 53 shots. Ward was named the first-star of the game. 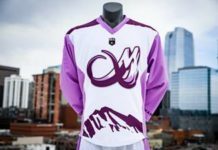 The Mammoth return home to take on the Georgia Swarm at Pepsi Center next Saturday, Feb. 16.